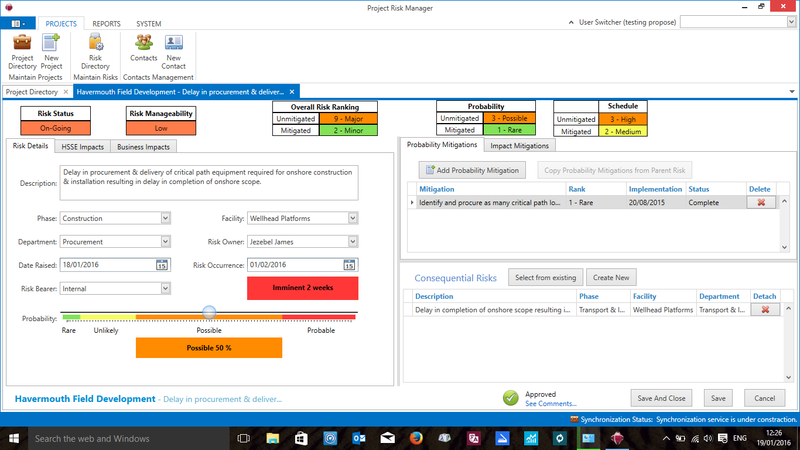 Our Project Risk Manager software application is now better and more accessible than ever before. We have improved the functionality of our FREE version to allow the addition of up to 5 active users, meaning you can now assign risk ownership to other members of your project team who can add and submit new risks for approval, as well as being able to manage the risks that have been assigned to them. Our PRO version allows you to add any number of active users and provides access to our Public Risk Directory from which you can search for, and copy, generic risks relevant to your own projects that have been shared by other subscribers. While both the FREE and PRO versions are hosted on our secure cloud servers by default, the PRO version can also be hosted on your own in-house servers at your request. You can upgrade, downgrade, or cancel your subscription at any time. Our PRO plan pricing is based on the number of active users selected (with the first 5 being free). So, if you decide to change the number of users, or cancel your subscription, your account will be credited or debited so that you only pay for the days that more than 5 active users are assigned on any selected PRO plan. If you downgrade your subscription from PRO to FREE, the monthly cloud hosting fee will be credited to the nearest whole month, while the active user charges will be credited to the nearest whole day. To manage your account, simply click on the "Log In" button above, or you can select the “Manage my account” link from within the application (located in the user profile menu) to access your account details, and then choose “Manage Subscriptions” from the main menu. 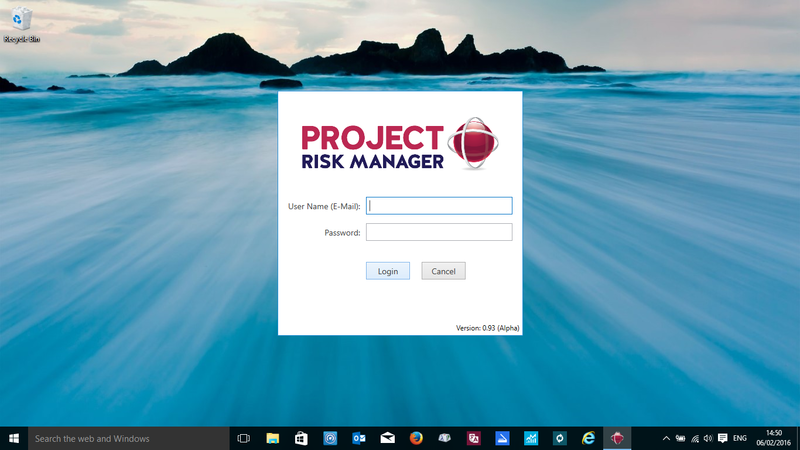 Each subscription to Project Risk Manager entitles you to download and install as many copies of the software on your local devices as needed, while the fully encrypted and secure database is maintained on our cloud hosted server. With each subscription you can store an unlimited number of projects, with an unlimited number of risks on each project. The only limitation is on the number of active users who are permitted to access the system. This is determined by the subscription plan you sign up for. The application is specifically tailored to allow multiple users to access their projects and risks simultaneously. User access rights are set by the System or Project Administrators who control which users have access to which projects and risks. Users may also work on their projects and risks while offline, as the system will automatically synchronise any changes made with the host database as soon as the user is back online. Risks may be copied from one project to another by any user, and may be printed or exported to Excel for wider application or distribution. 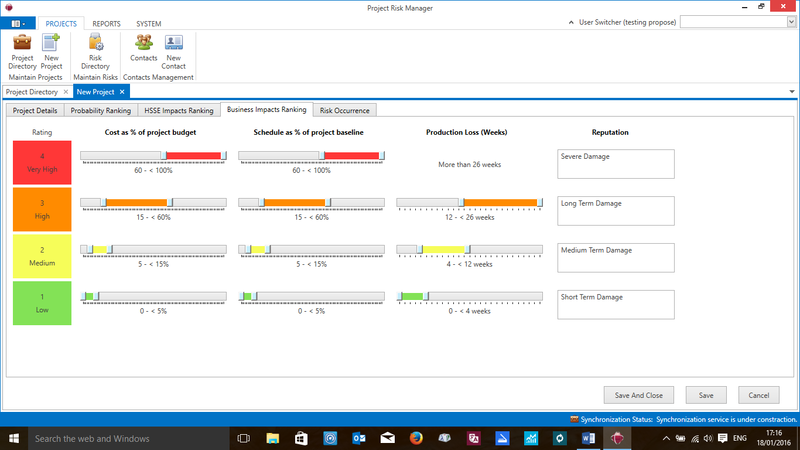 Project Risk Manager software is designed to be as intuitive as possible, guiding the user to define each risk and identify each impact as accurately as possible. The application makes use of pre-defined impact categories and impact rank descriptions to help the user select and rank the most appropriate impacts for each risk. Risk status is determined by the application through automatic risk ranking and evaluating the status of each mitigation applied to the risk. The application contains a Public Risk Directory, which allows all users to view and copy publicly shared risks to their own projects. Risks in the Public Directory may be filtered by a range of project specific criteria, including: Geographical Region, Industry Sector, Project Type, Duration, Phase, Facility, Budget and Department. Users may opt not to share their risks to the Public Risk Directory by either marking selected risks as “Private”, or they can mark entire projects as “Private”. No personal or company information is ever copied to the Public Risk Directory, and this information will always be protected on users’ local domains. A key to effective project risk management is to be able to identify which risks are parent risks and which are consequential risks. This helps to avoid applying unnecessary mitigations to consequential risks where the parent risk mitigations already adequately treat the consequential risk probability and impacts. 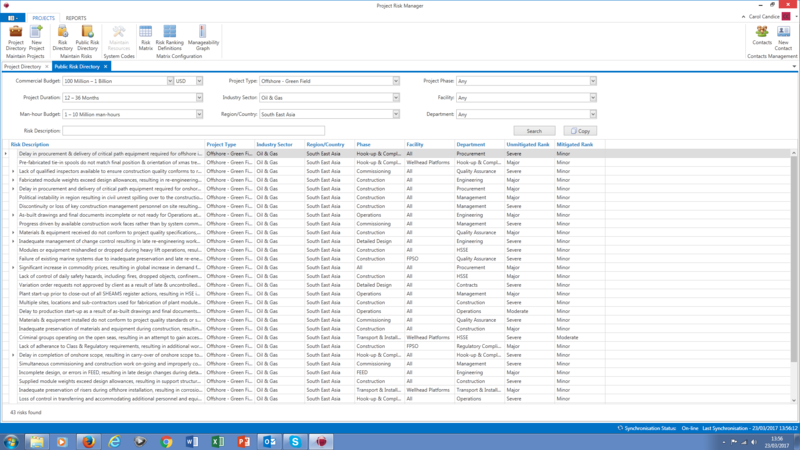 Project Risk Manager has built-in functionality which allows users to link parent and consequential risks, and copy mitigations from one to the other, thereby removing the need to apply separate mitigations to consequential risks where appropriate. Users are automatically notified whenever new risks are assigned to them, and whenever a risk occurrence date or target mitigation date is drawing near. 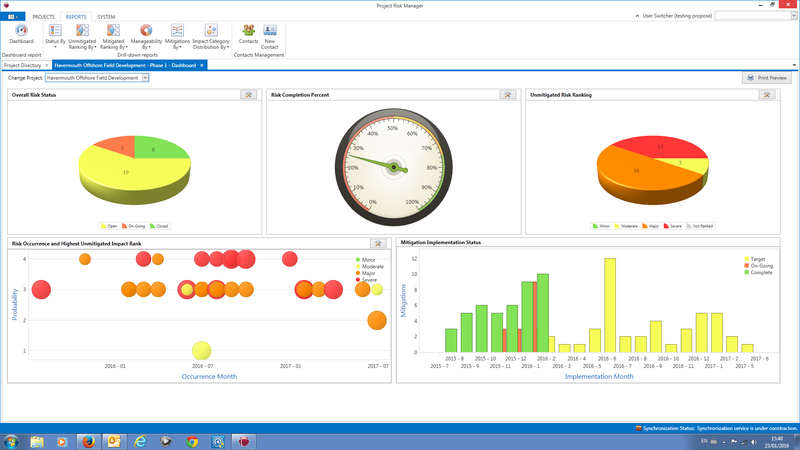 By sending automatic email alerts, this feature provides users with added assurance that whenever new risks are logged, risk occurrence dates established and target mitigation dates set, the assigned risk owners will always be aware of these events, even when they are not logged into the application. 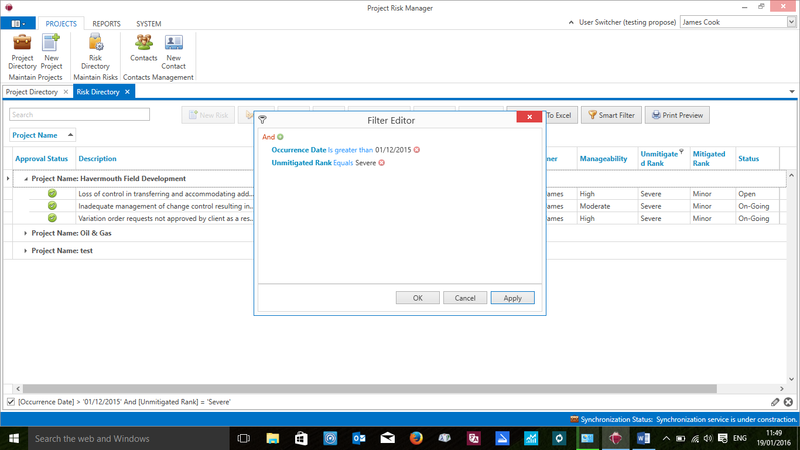 Project Risk Manager is highly customisable. While certain parameters, such as the risk ranking and manageability rules, are pre-set by the system and not editable, the application comes pre-loaded with default values and definitions for all the system resources which are customisable. The System Administrator may set and define all global system parameters to cater for all projects, while Project Administrators and Risk Managers may customise the ranges and definitions of risk probability, impacts and occurrence timescale for each of their individual projects. Risk registers are often very large and contain a broad range of data. This can make searching and filtering for specific risk information a cumbersome task when using static databases. Project Risk Manager applies not only a smart search form, which allows you to search for any numeric or text string in any field, but it also has a smart filter function which enables you to filter the risk directory for specific information across the entire range of data. The application provides detailed reporting at multiple levels, from printing and exporting entire project directories and risk registers, to running graphic drill-down reports for every risk element and each project resource. The dashboard reports give you an overview of the status of all risks on a project, and this content can be customised to display the information which is best suited for your reporting purposes.